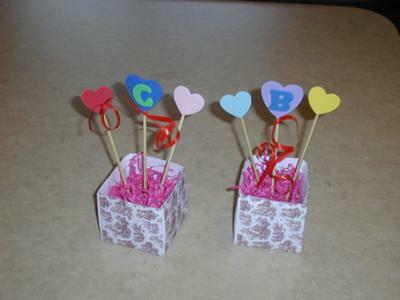 Place card valentine craft idea: I used the cube photo box from Hp (free to use) and some toile wallpaper that I had found online. I put the wallpaper on each side and bottom of the cube making sure it was faced so the pattern showed right side up. I printed it off on card stock and cut it out. I put it together and glued the seams. I then added some white foam I had laying around to fit in the bottom. This is easily cut with serrated knives. Then I added shredded paper on top to prevent seeing the white foam. Next I made 3 hearts on two different sized skewers. I glued the hearts on with hot glue. The largest one I added the last initial of the person to receive it. I pushed the skewers into the foam and had a beautiful decoration for the place setting.